Our Camaro demand. We didn’t actually demand this 1980 Camaro Sport Coupe. It demanded us. It did and it followed us home too. The truth is, we are the worst car negotiators in the world. We told the seller in no uncertain terms he would be better off NOT selling us the car. It would be worth something to someone, just not us. It still wasn’t worth the fraction of the asking price that we paid ten minutes later. 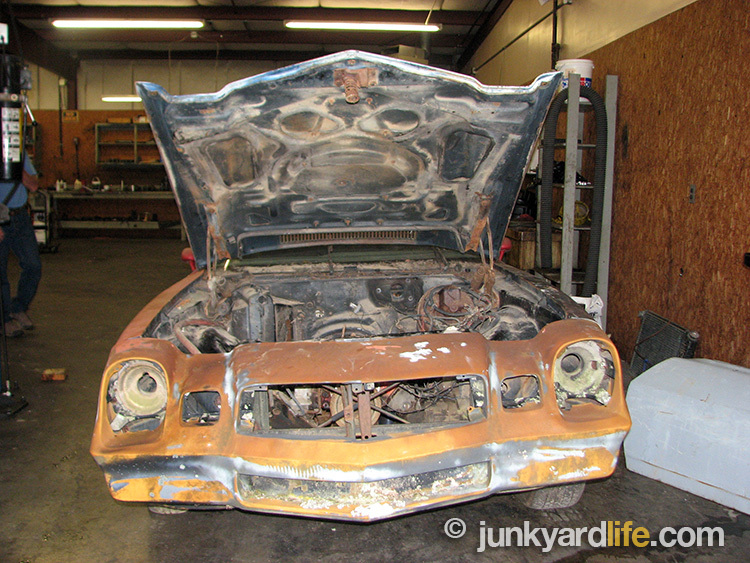 Junkyard Life has a lot of eyes working in our favor. 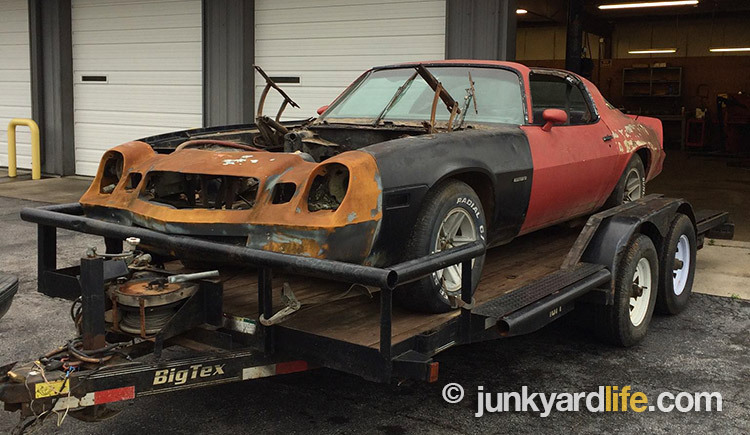 A friend in south Alabama somehow found what he thought was a 1980 Camaro Z28 when he was looking specifically for a 1980 Camaro Z28. Only this one was located in extreme north Alabama. So, to save nine hours of driving the length of the state, he called on us (Ron Kidd, Keith Lively) to go check it out for him. We took a truck and a trailer just in case this was one that he shouldn’t pass up. No worry there, friend. Pass. 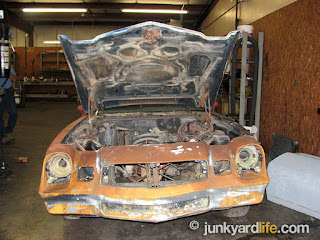 T-tops that rattle, busted tail lights and bad paint. What’s not to love? First of all, it wasn’t a Z28. It was a Sport Coupe that had seen better days. The day the world ended would be a better day than the day this car was having. We knew right away our friend did not want this car. This Z wannabe was having an identity crisis to be sure. It was a victim of a butcher who wanted a street racer, despite being a T-Top roof that would twist itself into a pretzel. It also would have a weight disadvantage. 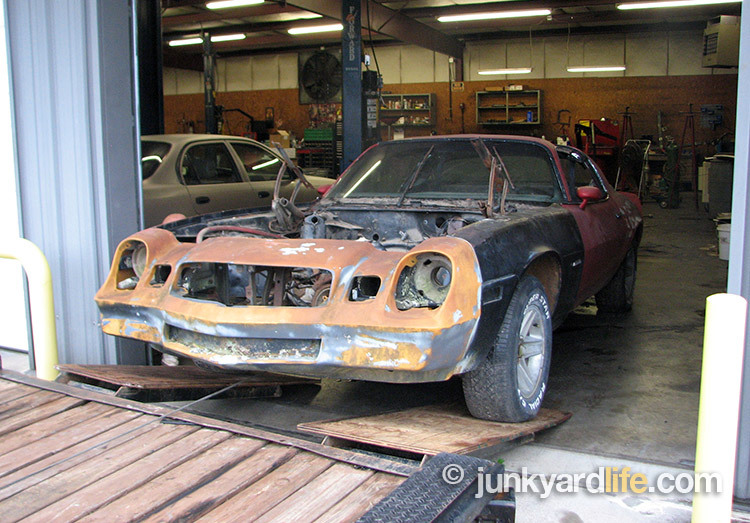 At some point a 1979 Z28 was involved in the assembled shell of parts that sat before us, seeing as it had a “tear drop” Z28 hood. It also employed a 1979 “130 mph” speedometer. The 1980 model Camaros (even the Z28) had a mandated “85 MPH” speedometer. We can imagine how well that went over with high performance consumers. This street warrior had something we have not seen in a while... traction bars! For our younger readers who don’t know what those are, you didn’t miss a thing. Big and gaudy bars hanging awkwardly from the rear wheels to eliminate wheel hop and give you better traction. 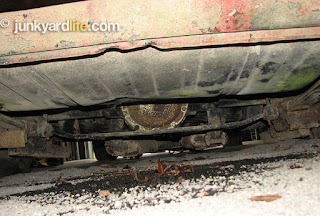 In reality, another thing to worry about seeing as the car could get caught on a speed bump, get stuck or rip out the rear axle. 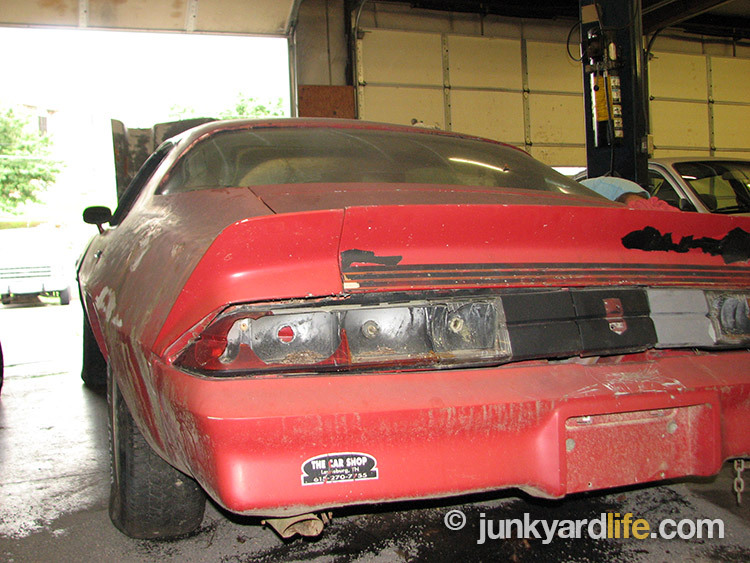 The bronze paint on the 1980 Camaro nose is original issue according to the "80" paint code. We love T-Tops, but these were in terrible shape and made the way for moisture to find its way to eat on those floor pans. 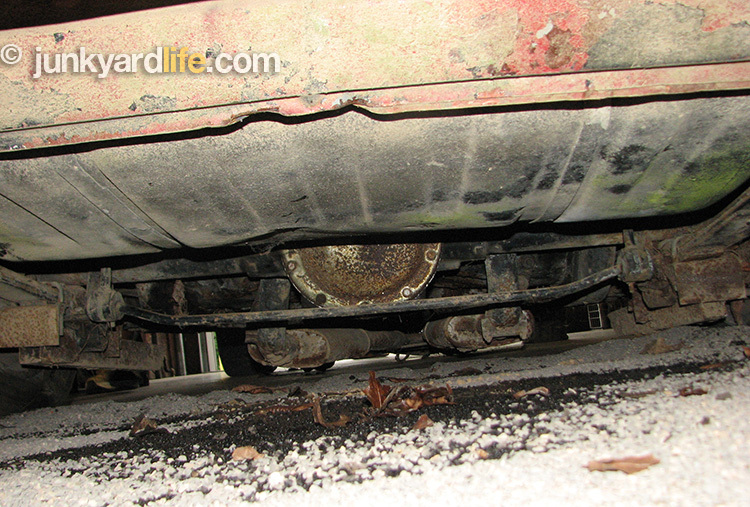 Floor pans? They were there. Kind of. So... no. Pass. Thank you for letting us look at it. We don’t want it. Looked beyond the grunge. See the sweet, cherry Camaro. We bought it anyway. To our credit, they were really persuasive salesman and we totally believed the “little old lady/church/grocery store” story. Why? Why would we do that? We really didn’t want it. 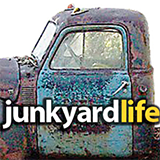 Well, it so happens Junkyard Life staffer Keith Lively’s dad needs a front subframe for his 1957 Chevy truck project and it did have that. 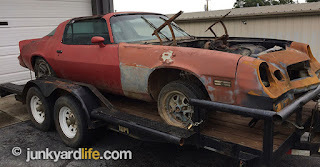 It also had three circa-1982 Z28 wheels. The fourth wheel? It was a 14-inch Oldsmobile Rally wheel. 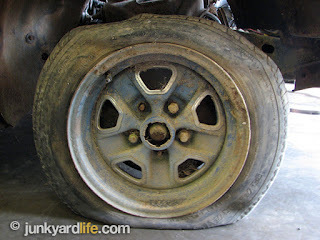 I (Ron) may be able to use a piece of it on our 15-inch SS3 wheels that we love. Also, attached to the aforementioned traction bars was a corporate 10-bolt rear with a chrome cover. Well, it used to be chrome. “Maybe it has a posi unit!” we said. It wasn’t. “Maybe it has a set of desirable gears in it!” we said. It didn’t. My, we Junkyard Life guys are optimistic. Is that why we bought it? Yes, optimism and the rear window with a defroster we may use on a future Pontiac project. Really. more the glass thing. Big sigh. Towing the Camaro back to Keith Lively’s home base. The Money Burner Jeep looks on disapprovingly. We didn’t want this car. That is a fact. In 1980 over half of all Camaros had the rear window defroster that Ron wanted. 51.3%, thus making it not so rare after all. The 1980 Camaro was only a little more than half as popular as the 1979 model. According to John Gunnell’s Standard Catalog of Camaro book. In 1979 there were 203,904 new Camaros registered in the United States and only 117,164 in 1980. This car was born with a unique color only offered in 1980. Paint code 80: Bronze. A beautiful one year only color that makes it even more of a crime that the car fell into the wrong hands with a renegade paint gun. By 1980, the second generation Camaro had been in production for 10 years and still had another year to go. 1982 marked the beginning of the next generation that would sell on for another ten years. 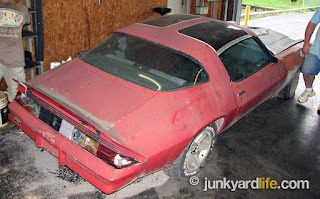 The 1980 Camaro Z28 was offered with a real Cowl Induction hood! This cool hood opened the rear of the hood scoop when the throttle was mashed. I would have done that everywhere I went. How cool! 1980 was the first year the Camaro received the government mandated “85 MPH” speedometer. It was not unusual for people to swap out the new one for any of the older units, like someone did on our car. It has a 1979 “130 MPH” face on it. It made people feel better. We picked up Ron’s daughter from Huntsville’s very classy and affluent Bridge Street mall area with the Camaro in tow. She was less than impressed. That is a fact. We are rather sure she ducked down in her seat before we got out of there. 1980 Camaros that were not lucky enough to get an anemic 305 V8 or a slightly less anemic 350, could have had a new economical V8-the 267. Rated at 120HP – it does not bother us that we have never seen one in a Camaro. 1980 Camaros have more of a following then we thought. We are following the restoration of an 1980 Z28 and our friend in south Alabama was looking specifically for a 1980. The ’79 Z28 hood vanished before we could load up the ’80 Camaro! A blue 14-inch Olds wheel could not make the Camaro look worse. Chrome rear diff cover, well, it’s rust and chrome. Loaded up an ready to be stripped. All in the name of love. One Camaro gives, so another Camaro lives. Notice that the fender almost matched the paint on rest of the car? We didn’t either.